New Delhi, India -- Asserting that the noble land of India owned the copyright to Buddhism, the 17th Karmapa Lama, Ogyen Trinley Dorje, flagged off a grand three-day service in the capital on Friday on the occasion of the Karma Kagyu school of Tibetan Buddhism completing 900 years, and said the faith had made a symbolic return to the land of its birth. The Karmapa called upon people to use the ancient wisdom of Lord Buddha and apply it to the contemporary world to promote world peace. The service began with a special homage to Lord Buddha?s relics at the National Museum in the capital, followed by interfaith prayers at the memorial of Mahatma Gandhi at Rajghat. The prayers culminated in a mega-discourse in the evening on the relevance of Buddhism. The day's celebrations also saw the revival of the tradition of the recital of Buddhist doha (songs) - which was sung in its original Sanskrit version after a millennium by Karnataka-based musician and researcher Nand Kumar. The doha composed by the great Buddhist master from Bengal, Tilopa, was retrieved by the Dalai Lama, who commissioned its musical composition for posterity. 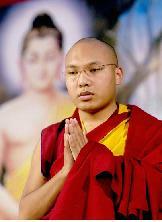 Addressing the gathering of more than 1,000 delegates from 44 countries, the 17th Karmapa said there were 'many reasons for holding the commemoration of 900 years of the Karma Kagyu lineage' - also known as the Karmapa lineage - in India. 'Who owns the copyright to Buddhism - the noble land of India,?' the Karmapa said. "India was the birth place of the Buddha and the wisdom of the 'mahasiddhas' - the early practitioners and scholars of the faith - came from India to the snowy land of Tibet? And it (Buddhism) became a true lineage of experience, realization and freedom from confusion. The lineage has remained unbroken for ages- abiding for hundreds of years in Tibet," the Karmapa said in his keynote address. "And now the noble lineage has returned to the noble land of India. It is a special honour to show our noble guests (from across the world today) as well as from the different regions of the Himalayas that the occasion for which we have gathered here is very meaningful to me," the Karmapa added. "What should we refer to Buddhism as (in this modern world)? Just spiritual guidance from long ago," he said. The Karmapa, who is hailed as the 'most outstanding monk in the Karma Kagyu sect led by the Dalai Lama', is believed to be the 17th reincarnation of Dusum Khyenpa, a monk born in 1110 AD in Tibet. Dusum Khyenpa is the founder of the Karma Kagyu sect of Tibetan Buddhism. History cites that just as Buddhism was waning in India, Tibetan monk Dusum Khyenpa, knower of the past, present and the future, instituted the practice of intentionally reincarnating in a way that disciples could recognise. According to Buddhist scholars, the practice (reincarnation) forms the backbone of Tibetan Buddhism as it is known today. Dusum Khyenpa founded three seats of learning in Tibet and is revered as the first in the long line of Karmapas. As a tribute to the monk, a statue of the Dusum Khyenpa, which is known to have spoken in the past, has been brought to the capital - to bless the congregation. The statue, originally housed in the Kham region of eastern Tibet was brought to India later by the monks of the Ripa Bharma monastery and installed in Karnataka. Highlighting the importance in Buddhist wisdom in modern times, secular Islamic scholar, writer and National Minorities Commission head Wajahat Habibullah said the unifying factor that connected the diverse faiths of India was 'compassion'. "But most of us over the centuries have not lived up to it. Jesus had preached compassion (like Buddha) and the first page of the Quran says 'in the name of God, the Compassionate, the Merciful'. Unless we have love for each other, all our achievements are not going to get us anywhere," Habibullah said. The celebrations will close on December 25.